Pam Tymchak finished last year’s race just before the first explosion. Pam Tymchak knows exactly where she was at 2:49 p.m. on April 15, 2013. She was celebrating the completion of the Boston Marathon – one minute earlier. “We had just crossed the finish line and put the blankets on,” the East Amherst resident remembered. Then came the two explosions just down the street. They left her unharmed but confused. Due to last year’s terrorist attack, today’s Boston Marathon certainly will rank as one of the most unusual in the annals of the event. The marathon is so popular and historic that the demand for spots in the race exceeds the supply of openings, so most runners have to qualify to run it. More than 23,000 did just that, while another 4,600 were invited back because they couldn’t finish last year’s race. That leaves several thousand other spaces in the field of 36,000; many of those participants will be running to raise money for charities. The event is close enough to serve as a goal and a magnet for runners with connections to Western New York. Every runner will make a statement just by showing up at the start, and emotions are sure to be high at the finish line because of the bombings. Still, snapshots of some local runners display their differences. In Tymchak’s case, she will bring a different mindset to this race than she did last year. While Tymchak barely finished last year’s race, Katie Siwy never had the chance. The West Seneca native and University at Buffalo graduate who now lives in the Boston area was just past mile 25 shortly before 3 p.m.
Now Siwy will do it again this year with some friends, personally raising a few thousand dollars along the way. As you could guess, running that last mile this time around will pack some extra emotion. “I know a lot of people here who have done ‘last mile’ runs, but many others haven’t participated. We want to be crossing that finish line after running the full distance,” she said. Back in Buffalo, Brian Stewart and Melina Buck work together at Fleet Feet. This will be Stewart’s first Boston Marathon, and it’s Buck’s second. People have always turned out in April to line the race course from Hopkinton to Boston. This edition is likely to attract large numbers of fans. “Even the thin spots, I’m sure, will have a lot more people than they normally do,” Stewart said. Steve Gonser of Hamburg has noticed a split in the reaction of his friends when he mentioned he’d be in Boston to run today. The runners in his life were very excited. But the non-runners had a different outlook. It wasn’t going to slow him down, since he has been planning this trip for more than a year. It’s Gonser’s first Boston Marathon. 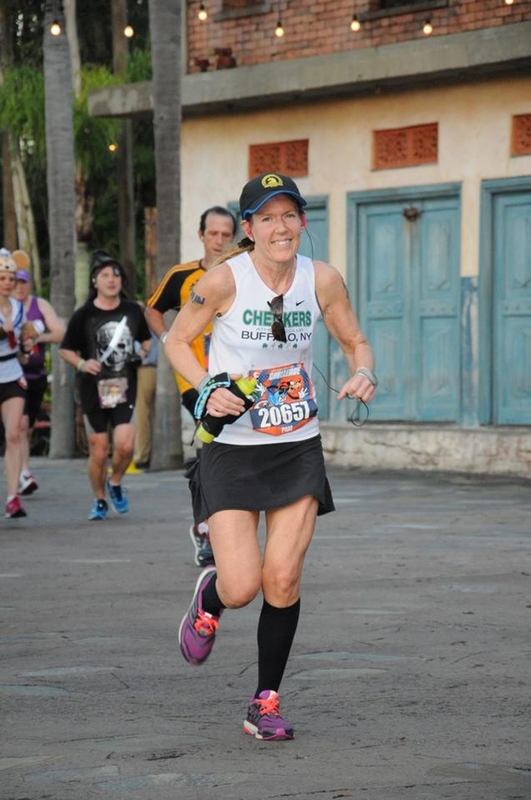 Finally, Aileen Hoak has a story different from most of the other runners from the area who will be running today. Hoak, who finished second in the Buffalo Marathon in 2013, has a target time for this race. Such a time would be three minutes faster than her performance here last May, when she finished second. She is closing in on the Olympic standard of 2 hours, 43 minutes, the time needed to make the United States Olympic trials in 2016. In the days leading up to the race, Hoak has tried to maintain a high level of concentration toward her goal. One of the area’s best runners is excited about the chance of competing with one of her idols, prerace favorite Shalane Flanagan of Massachusetts.